Hikaru Nakamura on the mark versus Boris Gelfand. 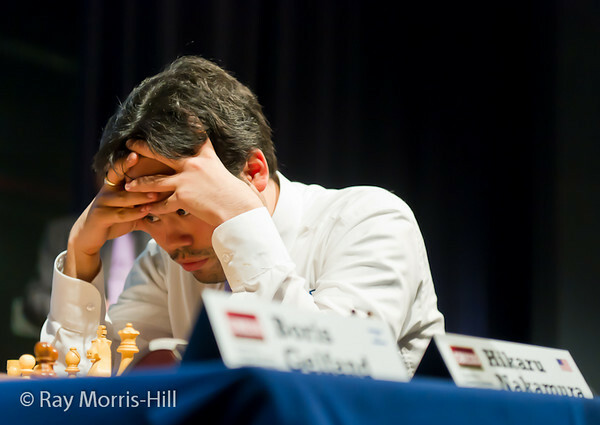 Hikaru Nakamura stormed to victory at the London Chess Classic in a new rapid format featuring 16 players in four sections. The top two from each section (double round robin) then went to in a knockout format. 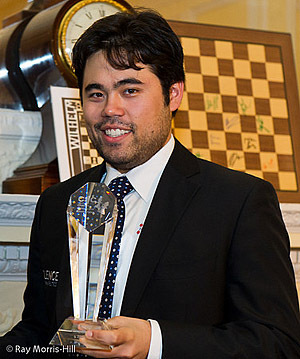 Nakamura defeated Boris Gelfand after winning a thrilling battle against Vladimir Kramnik in the semifinal match. Gelfand had beaten Michael Adams to advance to the final winning the right to face-off against Nakamura. In the first game, Gelfand played his patented Grunfeld defense, but was taken aback after Nakamura’s bold 11.Nxf7!? ultimately winning the exchange. Many felt this was a dubious attempt to rattle Gelfand. However, the Israeli got a nice piece play and may have missed an opportunity to apply pressure to white centralized king. After that the American bore down, kept the exchange and wrapped up the point. Now it was up to Gelfand to win with white and carry into tiebreaks. In an Averbakh King’s Indian, Gelfand was able to drum up complications and given Nakamura chances to go wrong. However, Nakamura waded through the mine fields and was actually better in the finally position. Thus, the American wins the London Chess Classic and cements his status as one of the world’s elite rapid players. This is part of the evolution of Nakamura’s quest to threaten the Carlsen-Aronian-Kramnik tripartite to change the order of the world rankings. He certainly has ambitions to challenge for the world title in the near future. This tournament present a more exciting format than it previous year’s and may have created a winning formula. IM Malcolm Pein is promoting chess through his Chess in Schools and Communities (CSC) and using the London Chess Classic as a platform to extol the virtues of chess.